So did you all have a great Christmas? I hope you’re still in ‘eat everything in sight, especially if it has chocolate’ mode, because this recipe is another indulgent Christmas treat – I thought I had better get it posted before people start trying to eat more healthily in the new year. These chocolate banoffee puffs are most definitely not healthy, but they’re definitely very, very delicious. 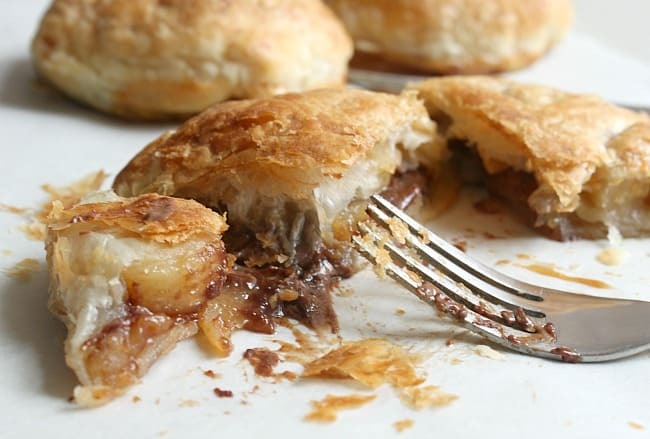 They’re also ridiculously quick and easy to make – just a square of puff pastry filled with a few slices of banana, a couple of squares of chocolate, and a good drizzle of fudge sauce. I’m literally drooling all over myself just thinking about them (well not literally, but near enough). I love the fact that when you take these out of the oven, they just look like a ball of pastry – certainly nothing drool-worthy. But as soon as you cut into them and that melted chocolate and fudge sauce oozes out, you know they’re something special. The banana flavour infuses through the whole little parcel, and since the only thing better than banoffee is chocolate banoffee, you’ll definitely want to make these in the next few days! These banoffee puffs are most enjoyable when you embrace the fact that you’ll probably make an absolute mess eating them – there will be flaky puff pastry flying everywhere, and you’ll more than likely end up with melted chocolate smeared around your mouth like a toddler. But that’s another reason that you should make this recipe around Christmas time – nobody cares! Make these while your family still think it’s perfectly reasonable to eat chocolate coins for breakfast, and they don’t mind that there are nearly fifty calories in one slice of Terry’s Chocolate Orange (there’s a reason we only eat them once a year…). In a week or so’s time, those chocolate coins will be replaced by something reminiscent of cardboard (probably some sort of bran), and your chocolatey afternoon snack will instead become some sort of fruit, so take advantage of the season by making this indulgent dessert while you still can! Heat the oven to 200°C (Gas Mark 6 / 400°F). Cover a baking tray in non-stick baking paper. Roll out the pastry until it measures approximately 14 x 14 inches, then cut it into 4 squares. In the centre of each square, add about a tablespoon of fudge sauce, and top with a few slices of banana and four squares of chocolate. 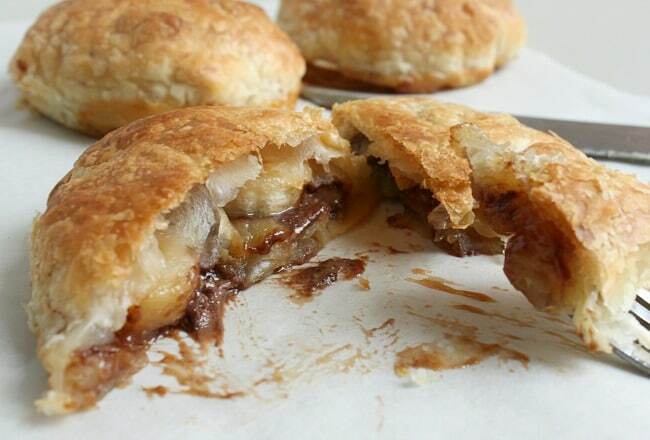 Carefully fold up the edges of the pastry, and squeeze tightly together to close each parcel. Place them seam-down on the lined baking tray, and bake for around 15 minutes, until puffed up and golden brown. These will keep for a few days in the fridge (you can reheat them in about 20-30 seconds in the microwave), but they’re best eaten straight after cooking otherwise the pastry can get a little soggy. I am an experienced baker and I would not make these again n a million years! Oh that’s a shame! I’m sorry this recipe didn’t work for you. I’m not sure what could have gone wrong, they’re pretty straightforward! Perhaps we just have different tastes? oh my goodness, i need these in my mouth! These look delicious!! My kids will LOVE these, too. You’re so right…we have to get all of our treats in before 2014 gets here! I’m all for maximizing my food-sins before New Years hits and I’m just eating carrots for months on end haha. This is perfection! Haha oh definitely, I’ve literally been on the chocolate by about 9am. Terrible! Those look wickedly good Becca! I have to try these. They look amazing. Beautiful photo. 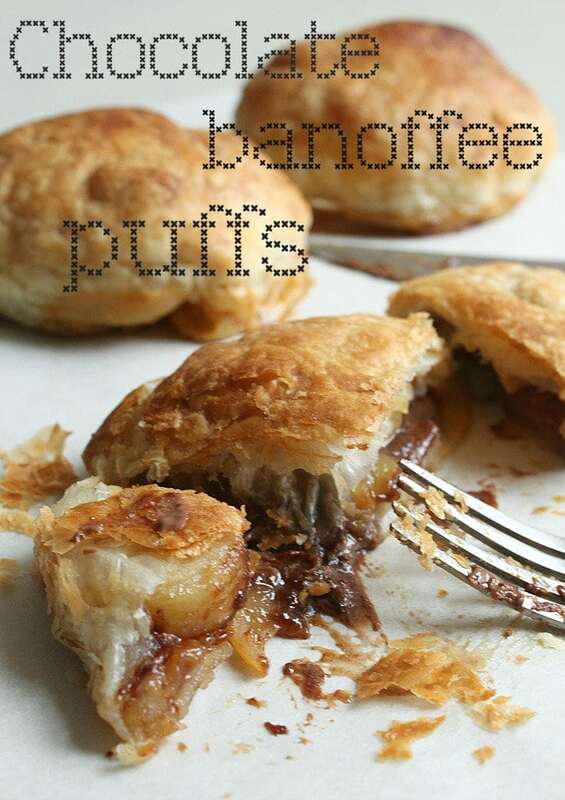 I’m making Banoffee pie this weekend, these puffs look delish! Yay :) something for my sweet tooth! I would never have thought of doing something like this! Looks fabulous, I will need to fit these in pre january detox! Oh nooo! I’m sure you could adapt the recipe a bit – maybe a slice of apple (you might need to pre-cook it a little) instead? Or you could go fruitless with some walnuts?